View down canyon from the Wedge Overlook into the Little Grand Canyon shows the colorful cliff-and slope-forming rock layers. Assembly Hall and Window Blind Peaks can be seen in the distance near the mouth of Buckhorn Draw, which enters from the left (north). Did you know Utah has its very own version of the Grand Canyon? Nicknamed the “Little Grand Canyon,” it is the deepest part of the San Rafael River canyon located directly beneath the Wedge Overlook (Overlook) in the San Rafael Swell (Swell). Looking down river from the Overlook, you can see where Buckhorn Draw—a narrow, winding canyon walled in by scenic sandstone cliffs—meets the San Rafael River canyon. Located in the northern portion of the Swell, numerous viewpoints along the dramatic Overlook provide stunning views of varied landforms sculpted mainly in multi-colored sandstone formations. Directly beneath the Overlook is a shear drop off of 1,200 feet to the San Rafael River’s deeply cut Little Grand Canyon. Panoramic vistas reveal the river winding its way through canyons of changing widths, surrounded by multi- layered cliffs, buttes, domes, and spires. A short distance from the Overlook, you can drive down through scenic Buckhorn Draw. 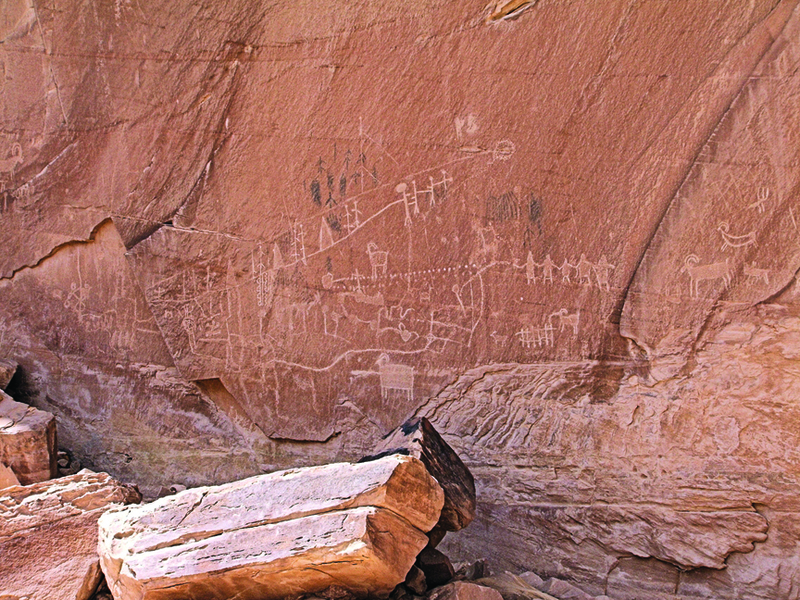 The steep canyon walls, which showcase several different colorful sandstone formations, contain a spectacular Native American rock art panel, as well as a three-toed dinosaur footprint. The drive from Castle Dale to the Overlook and down through Buckhorn Draw to Interstate 70 is designated a Utah Scenic Backway (Backway), which means the route meets the highest standard of scenic, recreational, and historical criteria, but may not be safe to drive year-round (unlike a designated Scenic Byway) and may require a high-clearance or four-wheel-drive vehicle. Allow approximately one hour and 45 minutes of travel time to drive the 51 miles of this Backway. The Swell is an uplifted area where sedimentary rock layers were arched skyward into an elongate dome-like structure (called an anticline). The upwarp resulted from compressional forces in the Earth’s crust about 40–70 million years ago. This mountain-building episode uplifted other areas as well, such as the Rocky Mountains to the east and the Uinta Mountains to the north. Millions of years later, erosion began in force, eventually removing thousands of feet of rock from the Swell’s crest, exposing older rocks (about 300 million years old) in the middle region of the Swell surrounded by a ring of younger rocks (ranging in age from 100 to 230 million years old). 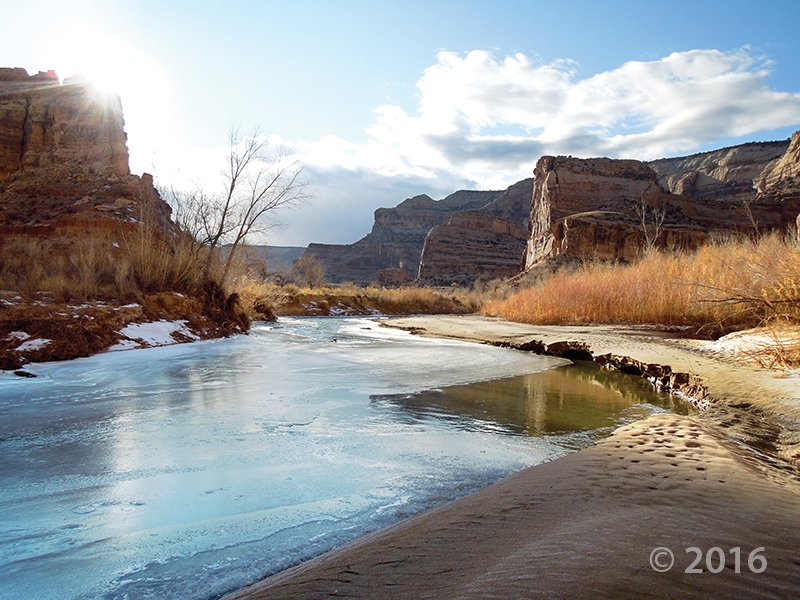 Numerous canyons were eroded into and through the Swell by rivers and streams. The San Rafael River, the largest river in the north part of the Swell, slices across the Swell, cutting deepest along the 3-mile stretch of the Little Grand Canyon. As you enter the Swell from the northwest, you follow geologic history back in time. From youngest to oldest, the strata include mostly sandstones of the Carmel Formation, Navajo Sandstone, Kayenta Formation, Wingate Sandstone, Chinle Formation, and Moenkopi Formation, which were formed in a variety of depositional environments (rivers, deserts, and shallow seas). Driving on Wedge Road to the Overlook you cross the Carmel Formation, which is composed of alternating beds of light-grayish limestone and light-brown fine-grained sandstone. The rock formation exposed at the edge of the Overlook is the Navajo Sandstone, which is probably the most famous rock formation in Utah. It is composed of mostly light-brown to white sandstone, and is sometimes seen as sloped domes or rounded knobs reminiscent of the ancient sand dunes from which it formed. 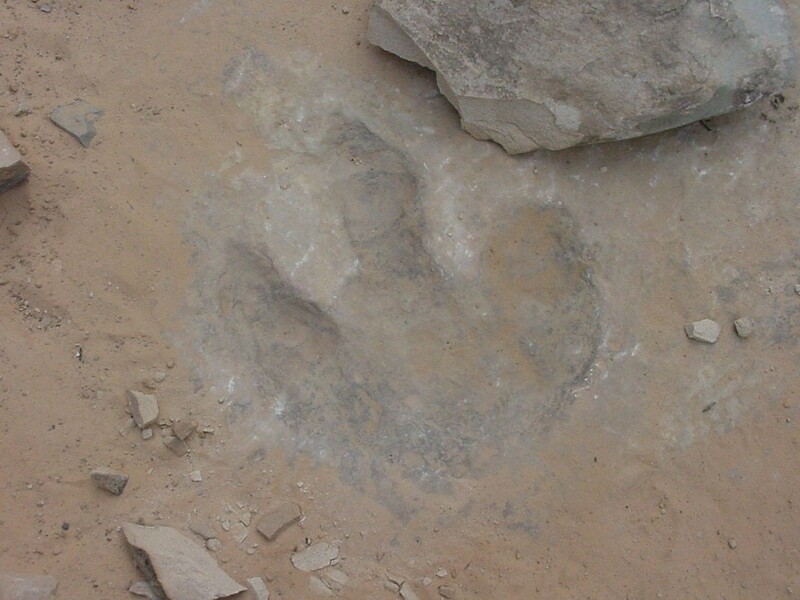 The Navajo Sandstone is also present as you first turn onto Buckhorn Draw Road, where you can see a three-toed dinosaur footprint on a ledge 10 feet up on the left side of the road. 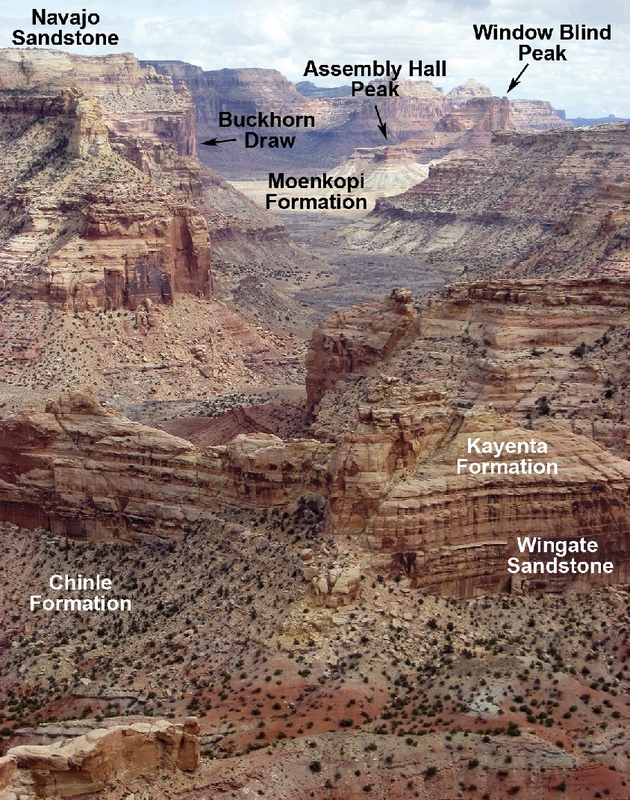 The underlying Kayenta Formation consists of reddish-brown sandstone and siltstone that forms slopes and benches. As you continue driving southeast on Buckhorn Draw Road, you see the red and pale orange vertical cliffs of the Wingate Sandstone which are home to the well-known Buckhorn Draw rock art panel. The Chinle Formation is composed of green-gray sandstone, red-brown sandstone, gray-brown limestone conglomerate, and maroon shale. As you exit Buckhorn Draw and cross over the San Rafael River, you can see Assembly Hall and Window Blind Peaks towering overhead. The formation exposed at the bottom of these peaks is the Moenkopi Formation, which is composed of red-brown fine-grained sandstone and siltstone. The Swell offers a variety of recreational activities including hiking, mountain biking, camping, and beautiful scenic drives. Campsites are available at the Wedge Overlook and in Buckhorn Draw at Swinging Bridge. All roads between Castle Dale and I-70 are well-maintained gravel roads, but may require a four-wheel-drive vehicle during inclement weather. Visit the Price Bureau of Land Management (BLM) Field Office at 125 South 600 West, Price, UT 84501 (phone: 435-636-3600) for directions, maps, driving conditions, and a list of other must-see sites in the San Rafael Swell. From the north, take exit 241 in Price onto State Route 10. Drive 28.5 miles and take a left onto the Green River Cutoff Road (EM401), labeled only as a San Rafael Recreation Access Road just before Castle Dale. At 0.2 mile down the Green River Cutoff Road, you will see a mileage sign for Buckhorn Draw (16 miles) and the Wedge Overlook (20 miles). Continue on this road for 12.6 miles to the intersection with Wedge Road (EM405). Go right onto Wedge Road and drive 6.6 miles to the Wedge Overlook ( N 39 ° 05.60 ‘ , W110° 45.39 ‘ ). Short drives along the canyon rim provide additional views of the Little Grand Canyon. To access Buckhorn Draw, drive back the way you came 4.4 miles and take a right onto road EM406. After 1.3 miles, go right on the Green River Cutoff Road, and in 0.2 mile take another right onto Buckhorn Draw Road (EM332). At mile 1.6, the dinosaur footprint is on the left (northeast) side of the road about 10 feet up on a ledge. The rock art panel is on the left side of the road at mile 5.8, and the Swinging Bridge (a now-unused, wooden suspension bridge built by the Civilian Conservation Corps in 1937) is at mile 9.5 as you cross over the San Rafael River and see Assembly Hall and Window Blind Peaks. You can then backtrack north, or continue south for 18.8 miles to I-70 if traveling to points east, south, or west. The approach from the south is via I-70. Take exit 131 onto Cottonwood Wash Road (EM332). The gravel road reaches the Swinging Bridge and Buckhorn Draw in 18.8 miles. San Rafael Motorized Route Designations, put out jointly by the BLM, Emery County, and Utah DNR. Map is available at the Price BLM office.